When it comes to going away with the kids, I want somewhere that is close to everything and easy to find. My worst nightmare would be finding out that accommodation is in the middle of nowhere and far from amenities and the fun. So when it came to booking our trip away to Scarborough in the school holidays, I searched for the best place to stay. 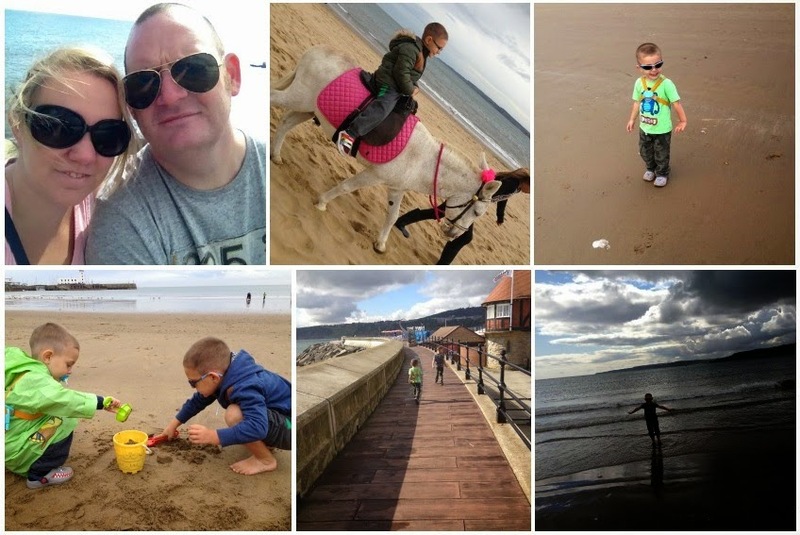 After searching various B&B's and hotels, I found that there was a Travelodge in Scarborough and was offered to stay there for a few days with my husband and the boys to show what we thought. 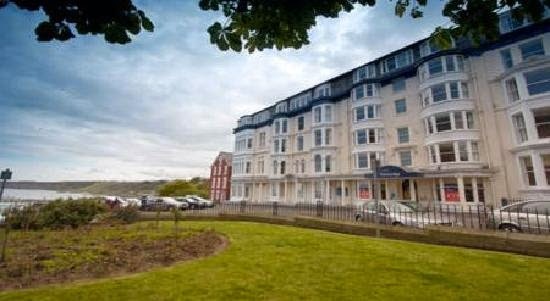 Travelodge is situated on St Nicholas Cliff, on the south beach of Scarborough. It is actually in the most perfect position when it comes to getting to the beach and finding shops. 2 minutes from the train station and slap bang in the centre of town, everything is in walking distance. Upon arrival, we were met by a lovely receptionist who took our details and gave us our key card to our room, showing us to the lift and pointing out the restaurant and bar areas too. It all looked clean and very tidy so we were happy to be staying. It is a very old building and this shows as you are walking around to find your room as there are various hallways you can go down to find different room numbers. I think that this is very quirky and loved that the period features in the hallways stood out. I was surprised at how spacious the room was. I was expecting a family room to just have a sofa bed squashed into the corner but it had a double bed plus 2 singles and space to walk around too. Big thick duvets to keep us toasty warm and heaters too. A full length mirror for posing into, a television with a few channels (all you need really) and a small seated area which had tea and coffee making facilities. The tea, coffee and milk was provided as was decaf coffee which was a plus from me as that is all I drink. Being that there was 4 of us, I was a little disappointed that there was no wardrobe or shelving unit adequate enough to put clothing on, just a small shelf and rack in the corner that was only really big enough for one persons clothes. We did remedy this by having our suitcase opened up on the floor which is where the size of the room and the floor space came in handy as it meant that we could leave it open and not have to worry about it getting in the way. The room did look a little dated in décor and the bed was a little creaky but I saw little signs and notices around about how the hotel was getting a make over in the months to come, so I guess that would remedy all of this. The bathroom was big also. Brightly decorated in red, there was a full sized bath and a toilet and sink. A small canister of bath and hair wash is left on the sink for if you forget your own. This was great for us as I hadn't brought bath stuff for the boys and the size of the bottle was perfect to last the few days we stayed at the hotel. A huge bay window with black out curtains shined light straight in to the hotel room. I just have to point out the black out curtains and how fab they were as I cannot sleep in there is one ounce of light in the room and so these were great for helping me get a good nights sleep. Out of the window was a fabulous view. Truly stunning, straight over the cliff-side and out over the ocean. I loved waking up and seeing this every morning. We visited the restaurant both mornings for our breakfast. I thought it was a great deal as, when we paid for our adult meal, the kids got theirs free. 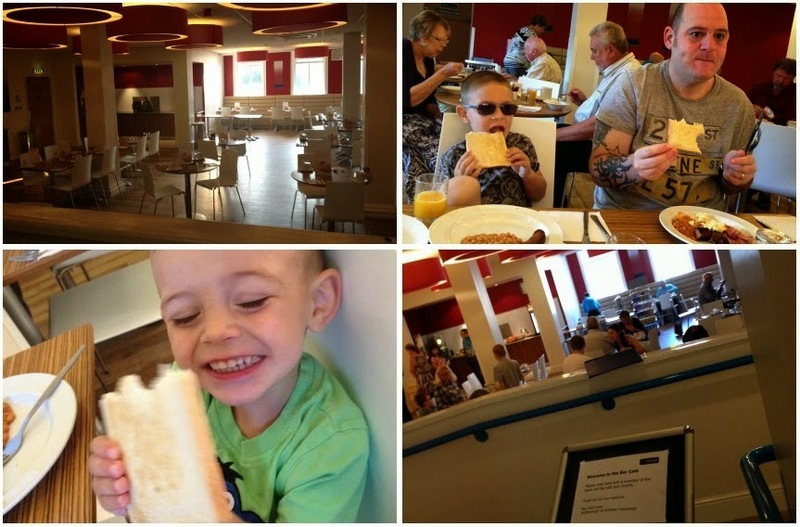 The breakfast was a buffet setting so you could choose from a hot fried breakfast with the choice of bacon, sausage, scrambled egg, beans and tomatoes, cold food such as croissants, cereal and freshly cut fruit and they also had a toast machine with jams and chocolate spread. Tea, coffee and juice was included on the breakfast price too and the staff were so friendly, one asking about my pregnancy and going off to find me some sachets of decaf so I could have a morning coffee. We also stayed for dinner one evening too. The boys picked their favourites of sausage and mash for Thomas and chicken nuggets and chips for Charlie, both plates finished off with loads of peas. Me and the hubster went a chicken fillet burger each which came with coleslaw and chips. There was a bit of a wait for the food but that can be expected when they are cooking for a hotel full, and the fact that you can order pizzas and chips to take-away too. The boys didn't mind so much about the wait as they had been given a huge colouring and puzzle sheet and crayons to play with. This kept them occupied whilst we waited. 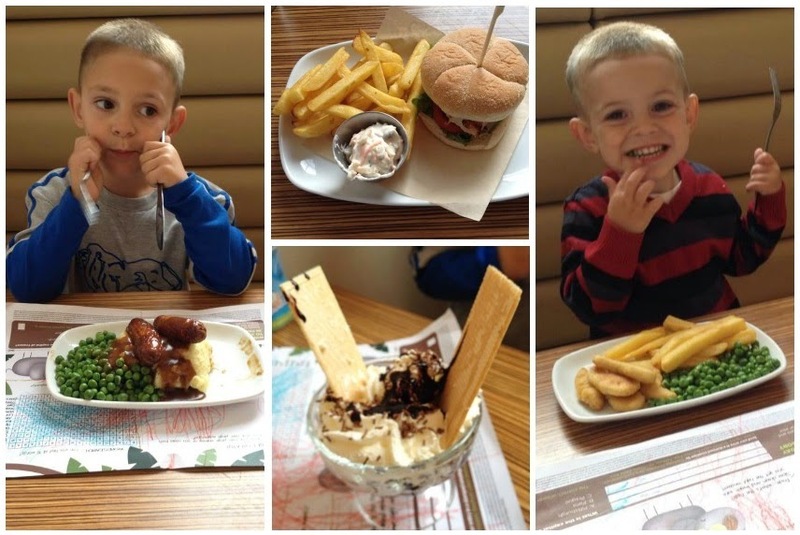 The boys did so well with their food that they both got a chocolate sundae for dessert. This was made up of vanilla ice-cream, cream and loads of chocolate sauce with wafers sprouting from the top. So huge that we even got to try a bit each too. Going out of the hotel, there are loads of things to do that are just minutes away. The city centre has a range of shops and eateries to dine in and there is the long walk down to the beach front if you fancy going that way. If not, just to the side of the hotel is a huge bridge going over the road that has steps down to the beach from there. If you have a pram or wheelchair then the tram is also just round the corner too which takes you directly down to the beach. A plethora of different amusements to play in. The all time favourite 2p machines were there in the hundreds and we even managed to get a Peppa Pig keyring to fall from one which made me so happy. I've never managed to get a prize before from one of those machines and it was great to see the boys winning. Teddy machines were fun too. I hate seeing the boys playing on them and coming away disappointed when they don't win. So instead, I let them have a few goes on the machines, and then pop them over onto the ones that cost a few pounds to go on but you're guaranteed a prize. After a couple of tries, the machine will pick a teddy up and you win. It's great to see the excitement on the boys faces as they win. We were a bit unlucky with the weather as it wasn't that great but it didn't stop us from playing on the beach, Thomas even braved the freezing water a had a little wonder through the sea. He even managed donkey ride too and gave us a laugh as the donkey decided to stop mid ride to relieve himself. Walking along the pier to watch the boats going in and out of the port, admiring the lighthouse and seeing Scarborough Castle were all great experiences to finish off our break away. 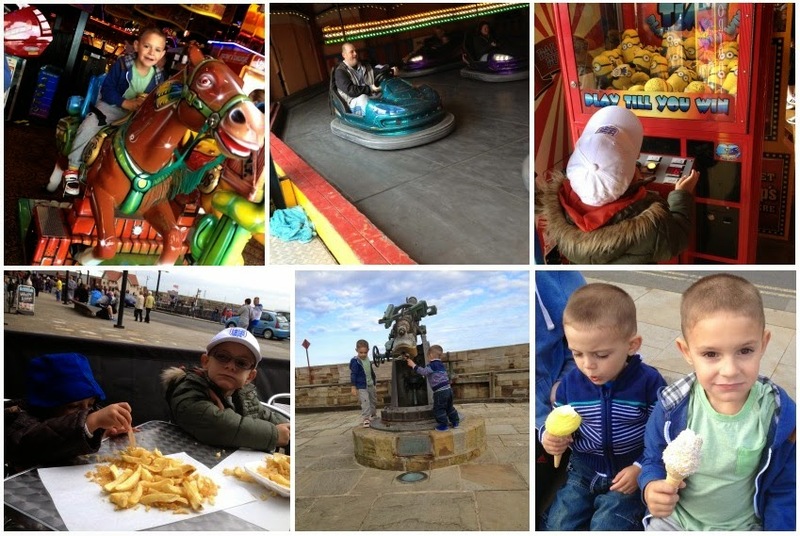 I really can't wait for our next adventure in Scarborough, we go every year. And I know that next time we'll definitely be staying at Travelodge again. 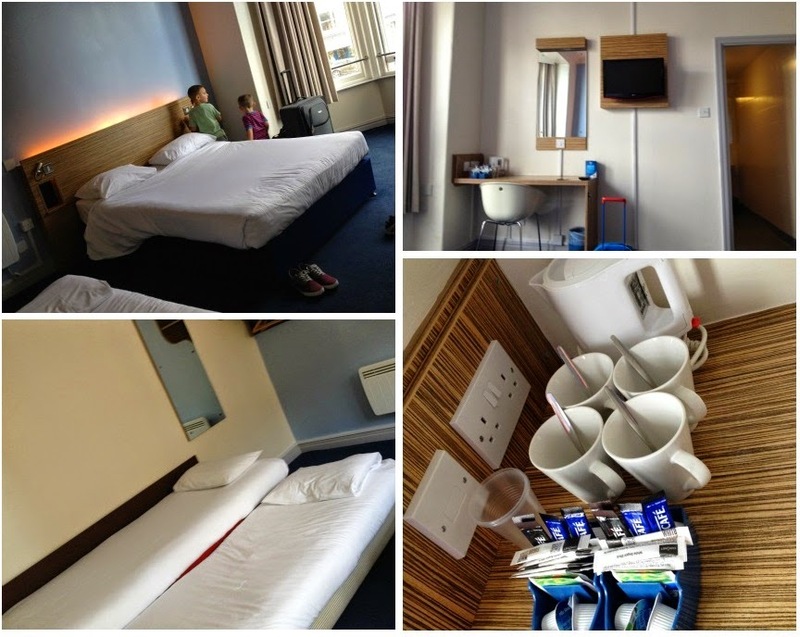 For more information about Travelodge and to book, visit the Travelodge website. I haven't done an update post for a while as these few weeks seem to have merged in to one and there wouldn't really be much to update on. I am now 21 weeks. 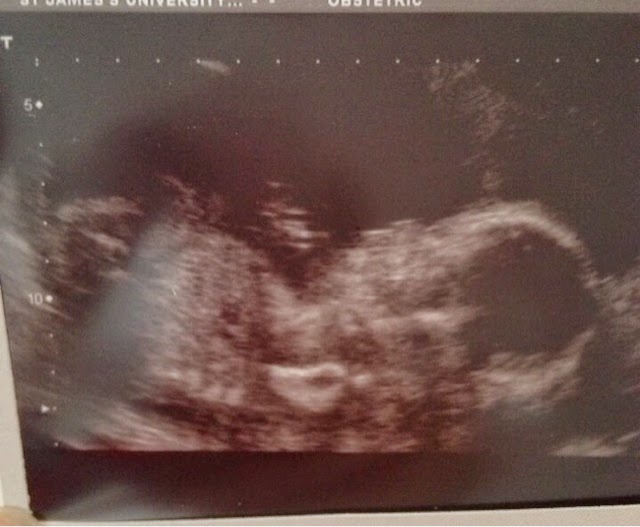 I had my anatomy scan this week where we got a second confirmation of our little boy. Well, not that we needed it as there was definitely boy bits on our gender scan. It was nice to see our little baby again although he didn't want to play ball. We couldn't get a great shot of his face as he kept his hands covering over himself as though he was playing peek-a-boo. I also have an anterior placenta which means that it is harder to get a clear shot as the placenta is in the way. Hyperemesis seems to have worn off now and I only really feel nauseous when I smell certain things or haven't eaten for ages. My bump feels massive now, by the time this baby is born I will be as big as a house but I've managed to find some great deals on maternity wear so am now comfortable which feels great. Since we are now past the half way stage, I have started looking at big baby items now. I am in love with the Cosatto Ooba in Duck Egg. It is absolutely stunning to look at and I love the Cosatto brand so have faith in it. The fab patterns and the colour are perfect for my little boy and I cannot wait for him to arrive so I can start pushing it around. We are going into town this week to finish off getting Christmas presents for the boys and get some more clothing for bump. Make sure you keep an eye on here to see te haul we come back with. I am a lucky mummy at the moment because I seem to have found the most comfortable pillow for pregnancy. Now, if you've never had a baby, then you probably wont understand why I'm so excited over a pillow but, it's not just a pillow, it's a sleep saver. During pregnancy, as your bump grows, sleep can be a bit hit and miss. With an ever expanding waistline and bump, getting comfy is hard and the fact that you have a baby constantly moving around inside you (and trust me, they prefer being awake at night). So when you come across a product that helps with this, it feels amazing. The Theraline Maternity and Nursing Pillow isn't just an ordinary pillow. It measures approximately 190cm x 38cm and is filled with around 42 litres of odourless polystyrene micro beads which are light as a feather. This filling then moves to the shape of your body and it always remains firmly in place without giving way to give you support and comfort. It can even be washed at up to 60°C too. The Theraline Maternity & Nursing Pillow keeps your legs and tummy supported and even your head and shoulders are too. It is more beneficial during the last months of pregnancy when you may become more restless with a bigger bump and constant movements and using it, you’ll experience less strain on your back and legs. During breastfeeding, using the Theraline Maternity and Nursing Pillow gives less strain on neck and shoulders as it holds your baby up into place meaning no slouching forward for mum alleviating any stress on the back too giving a more relaxed breastfeeding experience. My Theraline Maternity and Nursing Pillow came with a purple jersey cotton cover which is extra soft and has been pre-shrunk to stop it from disappearing in the dryer and coming out mini sized. 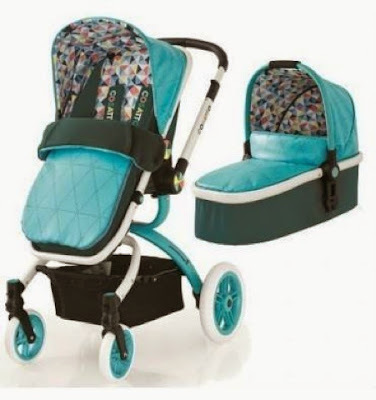 This gives it an immense amount of durability which is great as all that pulling and pushing around during the night and the fact that it can be used whilst breastfeeding and holding you baby too means that durability is key. I now don't have to use all my pillows to try and get comfortable as the Theraline pregnancy and baby feeding pillow is so versatile that I can change position very easily and as it is so long, it gives full support to my whole body giving a comfortable, good night's sleep. It can also be used whether you’re pregnant or not. Even my husband uses it sometimes as he had spinal surgery 2 months ago (and may need further surgery soon) and he finds it super comfortable. Some nights I have to fight it off of him. For me, I am now satisfied that as the months go by, and my bump gets bigger, I will be supported through sleep by the Theraline Maternity and Nursing Pillow and even once my bump has gone and breastfeeding starts, it will help to keep comfortable. You can find more information about the maternity and nursing pillow on the Theraline website and it can also be purchased from John Lewis too. Finding clothing during pregnancy is hard work. I find that loose tops end up making me look like a tent and tighter ones make me uncomfortable. Not only that but wearing a bra in pregnancy is horrible. The under-wire and cups seem to press against the top of my bump causing aches and pains. I want something that is loose around my bump but supportive around my breasts. Something that will mean that I don't have to worry about wearing a bra. A miracle probably. That's when I came across the Cantaloop Pregnancy & Nursing Tank Top. The Cantaloop Pregnancy & Nursing Tank Top is perfect for someone who is looking for a comfortable top to wear during pregnancy, and for one that will last the duration as it also doubles up as a nursing top too. It is A-shaped below the bust meaning that it can be used from even the early stages in your pregnancy and will grow out with you as your bump gets bigger. It adapts to the changes in the body's shape perfectly. The top is seamless so there is no stitching digging in at all and has an integrated nursing bra which is tightly knit underneath to give support and lift to the breasts. There is also no under-wire so the top part is super soft and comfy to wear whilst also giving a lot of support. One hand clasps on the top allow easy access to breastfeed quickly so are suitable for any occasion. You can breastfeed discreetly without exposing your stomach or much of your body at all. Overall, I love the Cantaloop Pregnancy & Nursing Tank Top. 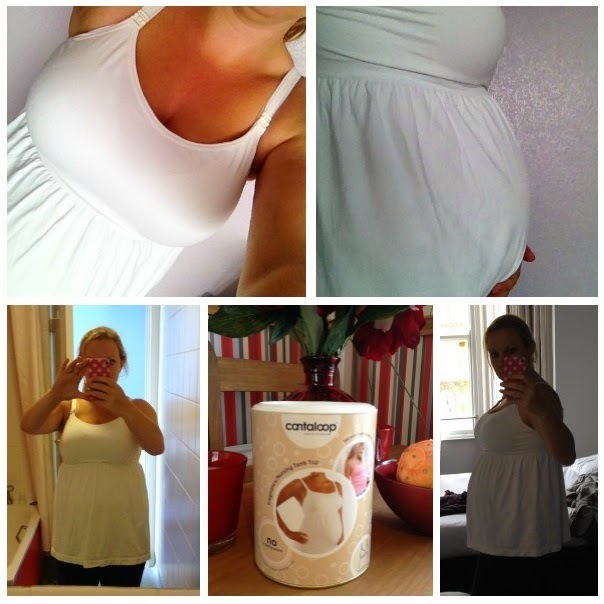 It has been a godsend during my pregnancy so far as it's stretchy materials hugs my bump and flares out at the bottom without pushing into my bump at all. The bust holds my breasts in place whilst also being comfortable to wear and ultra supportive. I know that when my baby is born and it is time to breastfeed, I will be able to use this top without fear of people seeing more than they bargained for. For more information about the Cantaloop Pregnancy & Nursing Tank Top visit the Cantaloop website and you can purchase from Amazon.